Bharatgas Mobile app facilitates consumers to avail LPG services- Now you can Book your refill & pay online, get refill history, your distributor details, Get safety instructions and avail various other services. 1. How to login ? You can login with registered mobile number. you will get OTP on your registered mobile number. After authenticate OTP, you need to generate Login PIN for future login. 2. What is skip login? 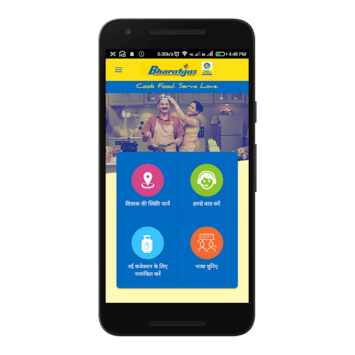 You can use BPCL new mobile app without login. there are limited features in without login. You can login anytime using Active login option. If you forgot your 4 digit login PIN for app, you can use forgot password to reset your PIN hence you will need to authenticate with your registered mobile number again. 4. Getting Authentication/Invalid/Unexpected/Network request error ? You can try services back after some time, if still getting same error please try to re-login. If continue getting same error, for privacy reason report your issue to developer email only. you need to share your registered mobile number with your report email. 5. How to re-login ? You can use forgot password option. App data will be reset and you can login again with registered mobile number. 6. Do not find-out payment option. You can pay for your refill booking online, after a fresh refill booking there make payment option available. you can pay for your refill using credit/debit/net-banking. If getting any error to make payment, for privacy reason report your issue to developer email only. you need to share your registered mobile number with your report email. 7. Not getting OTP ? Sometime OTP sending may be delayed due to a huge number of queue for SMS. You can wait or try after some time. 8. Query/Feedback for service request ? Your Service request, Address change, Mobile Change, New connection request are processed by your distributor. You need to contact with your distributor in case any query. 9. 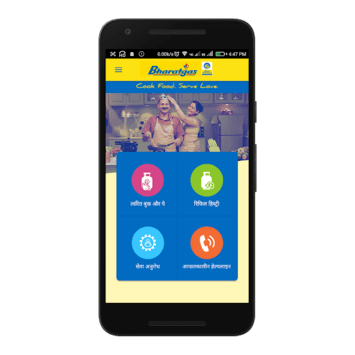 Mobile number not Avaliable with BharatGas error ? For privacy reason report your issue to developer email only and share your registered mobile number with your email. 10. Getting any other error ? For privacy reason report your issue to developer email only. you need to share your registered mobile number with your report email.